For the ethnic group, see Ifugao people. For the language, see Ifugao language. For other uses, see Ifugao (disambiguation). Ifugao (Ilokano: Probinsia ti Ifugao; Tagalog: Lalawigan ng Ifugao) is a landlocked province of the Philippines in the Cordillera Administrative Region in Luzon. Its capital is Lagawe and it borders Benguet to the west, Mountain Province to the north, Isabela to the east, and Nueva Vizcaya to the south. The Rice Terraces of the Philippine Cordilleras and Banaue Rice Terraces are the main tourist attractions in the province. These terraces are believed to have been hand-carved into the mountains 2,000 years ago to plant rice. However, recent research by carbon dating suggests that they were built much later. In 1995, the Rice Terraces of the Philippine Cordilleras were declared as a UNESCO World Heritage Site. In 2008 and 2015, the Hudhud chants of the Ifugao and the Punnuk (Tugging rituals and games) were inscribed in the UNESCO Intangible Cultural Heritage Lists. Ifugao is named after the term i-pugo ("i" [from/people] and pugo [hill]), which translates to people of the hill. Alternatively, the province's name may have come from the word pugaw, which means "the cosmic earth", ipugaw then referring to "mortals". Finally, the name may have been derived from ipugo, a type of grain in local mythology given to the people by Matungulan, the god of grains. Prior to colonization, Ifugao was a massive highland plutocracy, among the most sophisticated and prosperous of its kind in the whole archipelago and one of the two grandest highland plutocracies in Luzon, the other being the Plutocracy of Kalinga. The state existed for over 2,000 years and have built massive rice terraces that would be a symbol of the province in later time. There were no monarchs in the state. The state was ruled by its council of elders which led the state into a peaceful and prosperous plutocracy which developed one of the best agricultural technologies in Asia at its time. The state consisted of various subgroups which had similar yet somewhat distinct culture and traditions. Conflicts among the Ifugao people were resolved in the most peaceful way possible. Unlike most of the highland plutocracies in the Cordilleras at the time, the Plutocracy of Ifugao had the least conflict with lowland settlers. Kiangan was known as the birthplace of the Ifugao people and Hungduan as the epicenter of its culture. Ifugao became the center of warfare in the last year of World War II when Gen. Tomoyuki Yamashita launched his last stand against the American and Philippine Commonwealth forces at Mount Napulawan. He informally surrendered to Captain Grisham of the 6th US Army in the Philippines based in Kiangan, then formally surrendered at Camp John Hay on 3 Sept. 1945. Ifugao youth in their traditional clothing. The rainy season in Ifugao begins in July and runs through January. The weather remains cool from November to February. Mah-nongan - The chief god generally refer to as the honorary dead and creator of all things, even though Ifugaos do not consider any of their deities as supreme. Ampual - Of the Fourth Skyworld, is the god who bestowed animals and plants on the people and who controls the transplanting of rice. He is one of those gods who expects gifts in return for his blessings. Bumigi - In charge of worms, one of the eleven beings importuned to stamp out rice pests. Liddum - Is regarded as the chief mediator between the people and the other gods. Lumadab - Has the power to dry up the rice leaves, one of the eleven beings importuned to stamp out rice pests. Mamiyo - Stretcher of skeins, one of the twenty-three different deities preside over the art of weaving. Monlolot - The winder of thread on the spindle, one of the twenty-three different deities preside over the art of weaving. Puwok - Controls the dread typhoons. Wigan - Is the god of good harvest. Yogyog and Alyog - Cause the earth to quake. They dwell in the underworld. Ifugao culture revolves around rice, which is considered a prestige crop. There is an elaborate and complex array of rice culture feasts inextricably linked with taboos and intricate agricultural rites, from rice cultivation to rice consumption. Harvest season calls for grandiose thanksgiving feasts, while the concluding harvest rites tungo or tungul (the day of rest) entail a strict taboo of any agricultural work. Partaking of the rice wine (bayah), rice cakes, and moma (mixture of several herbs, powdered snail shell and betel nut/arecoline which is used as a chewing gum to the Ifugaos) is an indelible practice during the festivities and ritual activities. Agricultural terracing and farming are the principal means of livelihood. Their social status is measured by the number of rice field granaries, family heirlooms, gold earrings, and carabaos (water buffaloes). Prestige is also conferred through time and tradition. The more affluent, known as kadangyan or baknang, were usually generous by nature, lending rice to poor neighbors in time of food shortage(s) and/or hardship(s), in return for labor. Acting as village or spiritual leaders, creditors or commercial managers, these rich families exhibited their wealth by providing for many feasts, or cañaos. William Scott describes the details associated with the Ifugao house, "Square in floor plan, it is elevated to about shoulder height by four posts (tukud), around which are fitted cynlindrical wooden rat-guards (halipan), carrying two transverse girders (kuling) which support three floor joists into which the floorboards (dotal) are fitted and wallboards (goab and pamadingan) and studs (bagad) are mortised. The four studs, placed at the corner of the house, are mortised at their upper end into four tie-beans or purlins (wanan) which form a square to carry much of the weight of the roof as well as the central crossbeam (pumpitolan) on which stand two queenposts (taknang). These queenposts terminate in a small square (ambubulan) which supports the upper ends of the rafters (bughol), the roof being a true pyramid in form with four triangular sides and thus rising to an apex without any ridgepole. The wallboards are rabbeted into a transverse beam (huklub) at waist or chest height, at which point a shelf (patie) is fitted between them and the roof, whose eaves descend as low as the level of the floor. Above the tie beams a reed floor or platform is often fitted to make an attic-like storage space (palan) for unthreshed rice. Wooden panels close doorways on two opposite sides of the house, and entrance is gained by means of a ladder which is removed at night. This type of house is called bale (or fale), but the same basic building with a few modifications - the wallboards extend up to the roof, there is only one door, and the whole thing is smaller - serves as a rat-proof granary (alang)." Ifugao culture values kinship, family ties, religious and cultural beliefs. 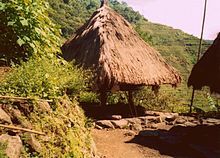 Ifugao are unique among all ethnic groups in the mountain province for their narrative literature such as the hudhud, an epic dealing with hero ancestors sung in a poetic manner. Also unique to the Ifugao is their woodcarving art, most notably the carved granary guardians bulul and the prestige bench of the upper class, the hagabi. Their textiles are renowned for their sheer beauty, colorful blankets and clothing woven on looms. UNESCO has inscribed two Ifugao elements in the Representative List of the Intangible Cultural Heritage of Humanity in 2008 and 2015, respectively. UNESCO has also inscribed one Ifugao site with five properties in the World Heritage Site in 1995. The inscription has five sites: the Batad Rice Terraces, Bangaan Rice Terraces (both in Banaue), Mayoyao Rice Terraces (in Mayoyao), Hungduan Rice Terraces (in Hungduan) and Nagacadan Rice Terraces (in Kiangan), all in the Ifugao Province, the Philippines. The Banaue Rice Terraces is not included in the inscription, but may be included through an extension nomination to UNESCO, along with other rice terraces sites in other Philippine Cordillera provinces. "The Hudhud consists of narrative chants traditionally performed by the Ifugao community, which is well known for its rice terraces extending over the highlands of the northern island of the Philippine archipelago. It is practised during the rice sowing season, at harvest time and at funeral wakes and rituals. Thought to have originated before the seventh century, the Hudhud comprises more than 200 chants, each divided into 40 episodes. A complete recitation may last several days. Since the Ifugao’s culture is matrilineal, the wife generally takes the main part in the chants, and her brother occupies a higher position than her husband. The language of the stories abounds in figurative expressions and repetitions and employs metonymy, metaphor and onomatopoeia, rendering transcription very difficult. Thus, there are very few written expressions of this tradition. The chant tells about ancestral heroes, customary law, religious beliefs and traditional practices, and reflects the importance of rice cultivation. The narrators, mainly elderly women, hold a key position in the community, both as historians and preachers. The Hudhud epic is chanted alternately by the first narrator and a choir, employing a single melody for all the verses. The conversion of the Ifugao to Catholicism has weakened their traditional culture. Furthermore, the Hudhud is linked to the manual harvesting of rice, which is now mechanized. Although the rice terraces are listed as a World Heritage Site, the number of growers has been in constant decline.The few remaining narrators, who are already very old, need to be supported in their efforts to transmit their knowledge and to raise awareness among young people." The Punnuk of the Ifugao was inscribed in the Representative List of the Intangible Cultural Heritage of Humanity in 2015 under the multinational inscription of the Tugging Rituals and Games element. ^ "List of Provinces". PSGC Interactive. Makati City, Philippines: National Statistical Coordination Board. Archived from the original on 21 January 2013. Retrieved 20 December 2013. ^ Cabreza, Vincent (July 15, 2013). [newsinfo.inquirer.net/445493/for-ifugao-rice-terraces-age-should-not-matter "For Ifugao rice terraces, age should not matter"] Check |url= value (help). Inquirer.net. ^ a b "Rice Terraces of the Philippine Cordilleras". UNESCO World Heritage Centre. Retrieved 2 January 2015. ^ a b "Facts & Figures: Ifugao Province". Philippine Statistics Authority - National Statistical Coordination Board. Department of the Interior and Local Government - Cordillera Administrative Region. Retrieved 2 January 2015. ^ a b c d e Lancion, Jr., Conrado M.; de Guzman, Rey (cartography) (1995). "The Provinces". Fast Facts about Philippine Provinces (The 2000 Millenium ed.). Makati, Metro Manila: Tahanan Books. pp. 76–77. ISBN 971-630-037-9. Retrieved 16 January 2015. ^ Felix M., Keesing (1962). "The Upper Cagayan Area". The Ethnohistory of Northern Luzon. Stanford University Press. p. 297. ISBN 9780804700498. Retrieved 2 January 2015. ^ Ingles, Raul Rafael (2008). 1908 :The Way it Really was : Historical Journal for the UP Centennial, 1908-2008. Diliman, Quezon City: University of the Philippines Press. p. 330. ISBN 9715425801. Retrieved 2 January 2015. ^ Bagamaspad, Anavic; Hamada-Pawid, Zenaida (1985). A People's History of Benguet. Baguio Printing & Publishing Company, Inc. pp. 297–300. ^ "Republic Act No. 07173: An Act Creating the Municipality of Asipulo in the Province of Ifugao" (PDF). House of Representatives of the Philippines. Archived from the original (PDF) on 2 January 2015. Retrieved 2 January 2015. ^ "Municipality of Asipulo, Ifugao". Department of the Interior and Local Government - Cordillera Administrative Region. 29 April 2013. Archived from the original on 6 February 2015. Retrieved 2 January 2015. ^ "PVAO recognizes Ifugao town for promoting valor and heroism of veterans". Philippine Information Agency. Philippine Information Agency - Cordillera Administrative Region. 9 December 2014. Archived from the original on 2 January 2015. Retrieved 2 January 2015. ^ "Re-enactment of WWII episodes steal show during Victory Day Celebration in Ifugao". Philippine Information Agency. 3 September 2012. Retrieved 2 January 2015. ^ Bitog, Rubyloida (18 August 2012). "Ifugaos to mark liberation". Sun.Star Baguio. Retrieved 2 January 2015. ^ "Proclamation of Masterpieces of the Oral and Intangible Heritage of Humanity; Hudhud Chants of the Ifugao". UNESCO. 18 May 2001. Retrieved 1 April 2016. The hudhud is recited and chanted among the Ifugao people - known for their rice terraces - during the sowing and harvesting of rice, funeral wakes and other rituals. Estimated to have originated before the 7th century, the hudhud - consisting of some 40 episodes - often take three or four days to recite. ^ "Hudhud chants of the Ifugao; Inscribed in 2008 (3.COM) on the Representative List of the Intangible Cultural Heritage of Humanity (originally proclaimed in 2001)". UNESCO. Retrieved 1 April 2016. ^ Bersola, Camille (2 January 2011). "The hudhud of Ifugao: Enchanting chanting". The Philippine Star. Retrieved 1 April 2016. Bringing more cultural pride, this Ifugao tradition had also received an accolade from the United Nations Education, Scientific and Cultural Organization (UNESCO). In 2001, it won the title of “Masterpieces of the Oral and Intangible Heritage of Humanity” given to 19 outstanding cultural forms of expression from the different regions of the world. In Asia, UNESCO honored six masterpieces, among them, the hudhud chants of the Ifugao of Northern Luzon. ^ Codamon, Daniel B. (22 May 2015). "Kiangan as the heritage town of Ifugao". Sun.Star Baguio. Retrieved 1 April 2016. Archaeological studies show Kiangan indeed is the cradle of Ifugao race and civilization. In June 2012, after more than three weeks of excavation, the Ifugao Archaeological Project (IAP) reported its findings on the "Old Kiyyangan Village" that constitutes the 1st Field Season of the IAP, a community-led project with the Save the Ifugao Terraces Movement (SITMO), the local government of Kiangan, National Museum of the Philippines, University of the Philippines Archaeological Studies Program and the University of Guam. ^ a b c d "Province: Ifugao". PSGC Interactive. Quezon City, Philippines: Philippine Statistics Authority. Retrieved 8 January 2016. ^ a b "Ifugao: Five Economically Active Persons Support Four Dependents". Philippine Statistics Authority. Philippine Statistics Authority. 4 March 2002. Archived from the original on 5 March 2012. Retrieved 2 January 2015. ^ Scott, William (1974). The Discovery of the Igorots. Quezon City: New Day Publishers. p. 199. ISBN 9711000873. ^ a b c d e Scott, William (1966). On the Cordillera. Manila: MCS Enterprises, Inc. pp. 178–180. ^ Habana, Olivia M. (2000). "Gold Mining in Benguet to 1898" (PDF). Philippine Studies. Ateneo de Manila University • Loyola Heights, Quezon City • 1108 Philippines. 48: 466. Retrieved 13 October 2018. ^ a b Bagamaspad, Anavic; Hamada-Pawid, Zenaida (1985). A People's History of Benguet Province. Philippines: Baguio Printing & Publishing Company, Inc. p. 94,114. ^ Sumeg-ang, Arsenio (2005). "4 The Ifugaos". Ethnography of the Major Ethnolinguistic Groups in the Cordillera. Quezon City: New Day Publishers. pp. 71–91, 202. ISBN 9789711011093.